Annamalai University Directorate of Distance Education (DDE) was established in the year 1979 and is credited with the largest enrollment of students in its programs in India. The university also offers more than 200 courses in a wide range of discipline including Fashion design, Hotel Management, Interior Design, Yoga, Music, Retail Management and more. Annamalai University offers Distance MBA under its management wing along with other undergraduate, diploma and postgraduate-diploma courses. The MBA is offered in 8 specializations including International Business, HR, Marketing Management, Hospital Management and more. The institute offers the Distance MBA course in Tamil and English medium. The duration of the course is for 2 years and the maximum duration to complete the course is 7 years from the day of registration. 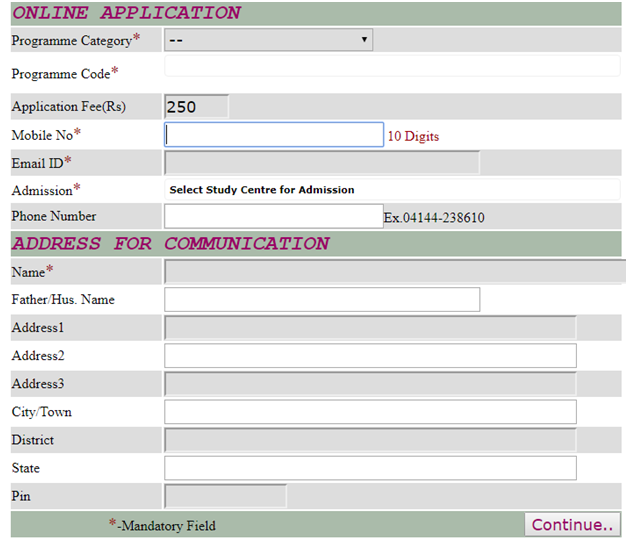 The application form may be obtained for admission from any of the study centers in person by paying an amount of Rs 250/- or through post by sending a request along with a demand draft of Rs 290/- drawn in favor of The Director, D.D.E., Annamalai University. The application form will then be issued by post. Log in to the official distance education portal of Annamalai University. Pay the application fee of Rs 250 through Debit/Credit/Netbanking. The candidates living close to the study center may appear for spot admissions with the required documents in person. They need to fill the application form and submit the below-mentioned documents (Original and at least 2 photocopies) and pay the required fee at the study center. This option is available for students who do not live close by to the Annamalai Distance Education Study Centre. The candidates will need to furnish the original documents in person, once the provisional admission cards are issued. The candidate will then receive a signed identity card, and the original documents by registered post confirming his admission. 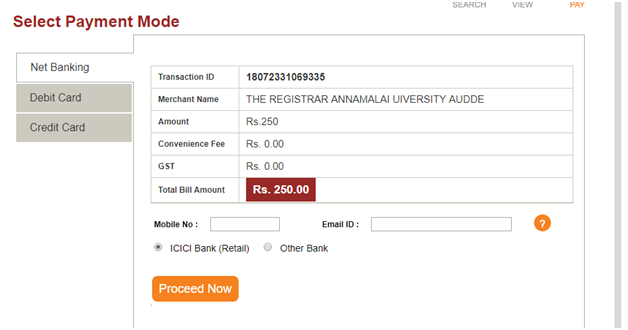 The application fee for the Annamalai University Distance MBA program is Rs 250. The institute charges a fee of Rs 13, 550/- for the first year and Rs 12, 300/- for the second year for its MBA and other specializations courses. The fee may be paid in two installments for each year. The university also offers flat 50% fee concessions to all regular college (on-campus students) and All Annamalai University distance education students if they enroll concurrently in any additional diploma/ certificate / PG Diploma courses. The university also exempts physically disabled students to pay any tuition fee. The fees for any course may be paid through Demand Draft, Credit card/ Debit card, e-payment, etc. Scholarships are available to SC/ST students and they are eligible to obtain a refund of the non-refundable fees provided they are unemployed and their parental income does not exceed Rs2, 50, 000/-. These students must apply separately for the scholarship utilizing the appropriate form issued by the Department of Adi Dravidar and Tribal Welfare or SC/ST Departments of the respective State Governments, before 30thNovember of each year of study. The refunds shall be made directly to the bank account. Students who have passed a qualifying examination under a 10+2+2 year pattern will not be considered for admission. Annamalai University offers MBA course in English as well as Tamil Medium, and offers specialization courses only in English Medium. The university is recognized by the UGC as it was established under an act of government and it has all its courses approved by the Distance Education council. Furthermore, the university is also recognized by the MHRD, Department of Education. Annamalai University is a highly ranked university. It has been ranked 12th amongst the best distance universities in India by Careers360 in the year 2012. The university is continually ranked at the top as one of the best distance education universities in the country. The University is also ranked wholly for its traditional courses at 41st in India. The institute has various study centers throughout the country to cater for the resources the students require. The study centers have the following facilities available: Library, Audio/ Video Cassettes or CDs, Study Materials, Previous Year Question Papers. The institute also has many Information centers throughout the country to facilitate counseling for the students, sales of admission forms, spot admissions, etc.